The Yellow-backed Weaver Ploceus melanocephalus, sometimes known as the Black-headed Weaver, is found mainly along rivers and wetlands. The breeding male has a black head, and the underparts vary from bright yellow in the west to chestnut with a yellow belly in the east. It differs from the very similar Golden-backed Weaver by having a yellow hind collar that contrasts with a plain green back, slender bill with curved culmen, and a brown (not red) eye. The larger Village Weaver has a yellow back with a black 'V', red eye, and a heavy bill. The female Yellow-backed Weaver is sparrowy - it is much browner than the female Golden-backed Weaver, with no yellow on the underparts except for a little on the throat. In West Africa the female and non-breeding male Yellow-backed Weaver resemble the Vitelline Masked Weaver but have pale (not orange) eyes, and a 2-toned bill (black above, pinkish brown below). P. m. melanocephalus, in Mauritania, Senegal, Gambia, Mali and Niger (see red on map). 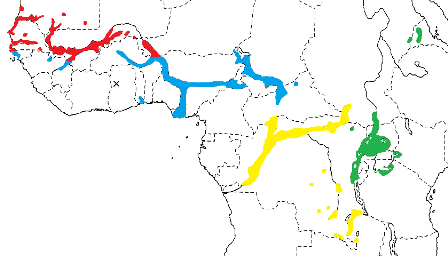 P. m. capitalis, in Guinea-Bissau, Guinea, Burkina Faso, Ghana, Togo, Nigeria, Cameroon, Chad and Central African Republic (see blue on map). This race has more chestnut below than the nominate, and the upperparts are more yellow. P. m. dimidiatus, in Sudan, Eritrea, DRCongo, Uganda, Kenya and Tanzania (see green on map). This race has rich chestnut underparts, with the yellow restricted to the belly. P. m. duboisi, in PRCongo, Central African Republic, Sudan, DRCongo and Zambia (see yellow on map). This race has yellow underparts, without any brown wash, and also has a longer and more slender bill. The Yellow-backed Weaver inhabits damp areas with tall grass near rivers or standing water, and is also found in reedbeds and papyrus, but it may forage in tree savanna in drier areas. The Yellow-backed Weaver feeds on seeds and insects, while the young are fed mostly with insects. The Yellow-backed Weaver forms flocks in the non-breeding season. The Yellow-backed Weaver is polygynous, with two or three females in his territory simultaneously, but is sometimes monogamous. The Yellow-backed Weaver is a solitary nester, or colonial and may nest alongside other weavers. The male displays by fluttering his wings while hanging below the nest entrance. The nest is globular or onion-shaped, and there is no entrance tube. The outer shell of the nest is tightly woven by the male from grass, and s ceiling layer of grass strips is included. The nest is lined by the female with fine grass, and sometimes with some feathers. The nest is slung between vertical stems or supported at one side only in elephant grass, reeds, or papyrus over water, or even in a maize field. Sometimes nests are suspended from twigs in a bush or small tree, usually more than 2 m above the ground. The male repairs damage to nests during construction, but not once a nest is occupied. Leaves are stripped around the nest, making it conspicuous. The clutch is 2-3 eggs. The eggs vary and may be dull white, blue-green, pinkish-grey or brown, either plain or heavily freckled with olive-brown. Incubation is by the female only, but both sexes feed nestlings. Brood parasitizm by the Diederik Cuckoo Chrysococcyx caprius has been recorded. 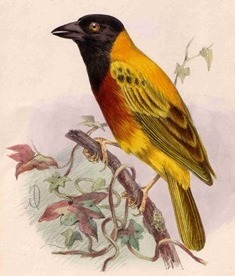 There are 2 PHOWN records for the Yellow-backed Weaver (see PHOWN summary), although they are of a male that escaped from captivity. Many more records are needed of this common species. Submit any weaver nest records to PHOWN (PHOtos of Weaver Nests) via the Virtual Museum upload site.